The Best Dog Crates, Pens and Gates for Your Lifestyle! 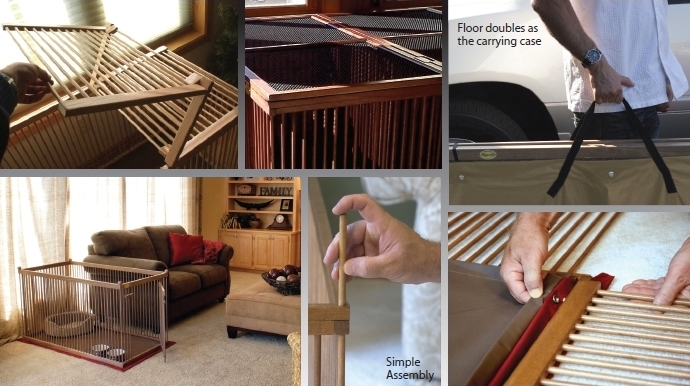 Pupperton offers the highest-quality premium-hardwood in-home pet confinement products available. Whether you're shopping for smaller dog crates to use as beds, larger indoor exercise pens for day-long confinement, or wooden pet gates for pet areas in your home, you can trust Pupperton to deliver quality and options that precisely match your unique style. Plus, the only place where you can Contact Us for that unique CUSTOM pet confinement product you've been thinking about getting for your pet! How will you return that love when you have to leave your dog home alone? One of the best ways is to give her the best wooden dog crate or pen money can buy. Your indoor dog pen is your pet’s home – a safe and comfortable place where she has feeling of security when you’re away. Larger dog pens are particularly important if you’re gone all day to keep your pet out of trouble and provide space for all the needed "extended stay" amenities, and smaller dog crates satisfy your pup's need for their "den" instinct. We offer a large range of dog pen sizes. If you only crate your dog for short periods, choose a smaller crate, or for day-long stays, choose a 4 x4 large indoor dog pen so your pup has room to eat, sleep, play, and potty when absolutely necessary - all in adequately distanced areas. √ The best wooden dog crates and dog pens provide maximum safety! Pet professionals agree that indoor dog crates and pens are by far the safest place for smaller dogs when leaving them home alone. With both upper and lower latches on a locking gate, a snap-on attached waterproof floor, and an available lock-on top cover ensure safe-keeping, Pupperton is an obvious choice. Think of it: you’ll have this piece of Pupperton furniture for your entire dog's life - and for your life too. That’s why the investment in a solid, premium hardwood dog pen makes a lot of sense. Our patent-pending design features are industry innovations that will be appreciated every day. The snap-on floor can be machine-washed and dried, and a chemical-tolerant finish on the wood makes cleaning a breeze. Pupperton pens can be set-up and packed-up in under 2 minutes - and the floor doubles as the pen's carrying case for easy transport! Gate operation is a simple 3/4" lift to latch and unlatch - no fiddling with slides or small latches near the floor. Vertical-only fence dowels inhibit climb-outs; top covers are rarely needed for small dogs. Pupperton stands behind every product we make by covering your product with a lifetime limited warranty and customer service that make sure your product will be repaired to like-new condition if it should ever be necessary. Each pen is signed and serial-numbered by the shop craftsman who builds it - we take quality seriously. √ Concerned about chewing? Don't be! Our crates are specifically designed to inhibit chewing, but if in the rare case it does happen, you are covered by our limited lifetime warranty for all needed repairs. For added protection we also offer wood dog crate fence protectors/liners. √ Delivered to your home - Fast! A wire, fabric or plastic pen can be a real eyesore in your living room. Replace it with a beautiful red oak, maple or cherry hardwood pen in a color stain that matches the other wood furniture or woodwork in your home - we’ll build and send it to you in a few days to weeks - not months!